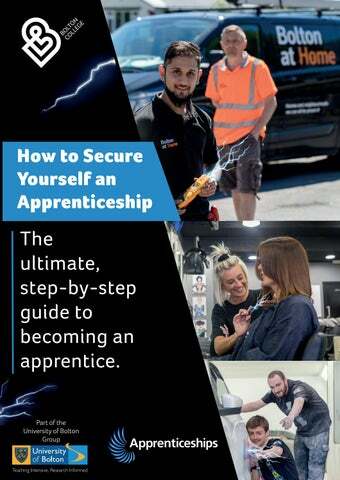 How will this booklet help me to secure an Apprenticeship? Do you want to be an apprentice but you don’t know where to start? Or, maybe you’ve been applying for Apprenticeships but have had several set-backs? If the answer is yes, then this guide is for you! This booklet was created to help young people, giving you step-by-step advice on how to secure an Apprenticeship, from creating a CV to cold calling local companies. In order to provide you with first-class information and advice, we’ve brought together top tips from local employers, careers advisors and current apprentices learning at Bolton College. For more information about Apprenticeships, call our Apprenticeships Team or view our vacancies online today! Do you already have an employer? The college interview will involve an informal talk with the course tutor, who will ask you a variety of and career aspirations. This is the perfect programme. Apprenticeships are a great way to learn whilst still bringing home a decent pay packet. Some Apprenticeships already attract UCAS points or allow you to study for a Technical Certificate. Once the Apprenticeship has finished, there’s the opportunity to carry on working, possibly to get promoted or to go on to Higher Education in a college or university. Which Apprenticeships are available at Bolton College? Here are some examples of the types of job roles you can progress to from each Apprenticeship. We’ve split the process of becoming an apprentice into manageable steps - use this journey map for guidance and inspiration. Secured an interview? Refer to companies you would like to work Search the internet for each you are going to contact them in person, by phone or by email. on 01204 482 036, who will invite you in for a basic skills assessment. They will also liaise with your employer to ensure you get the support you need. employer / company record their response. you dress smartly! as you go along. The end is near keep climbing. Don’t give up! feedback can sometimes be helpful. The way to do many things is to do one thing at a time. First Steps Now that you are sure which Apprenticeship you want to complete, the next step is finding an employer or a vacancy. Competition for places with employers can be fierce, so you will need to show that you are committed, enthusiastic and passionate about the industry that you are hoping to enter. If you are registered with Jobcentre Plus, ask them if they can put you forward for any free training or employability courses. Any training that you complete will enhance your CV and help to keep you motivated! If the job centre put you in contact with employment agencies, ensure that you maintain regular contact with them, as they often have members of staff that are employed to engage with local employers and secure vacancies for you! Attend as many careers / jobs fairs as possible; employers attend these because they want to recruit! Hidden vacancies and speculative applications Many vacancies never get advertised, so you need to be on the lookout. Check the local press show an employer that you are resourceful and can use your initiative. Even if they have no current vacancies, they may retain your details for future reference. To search for Apprenticeship vacancies, register your details with The National Apprenticeship Service at www.apprenticeships.org.uk. Also, regularly check www.boltoncollege.ac.uk/ apprenticeship-vacancies and Jobcentre Plus www.gov.uk/jobsearch Before you start approaching employers and registering with job search websites, you must ensure that you have a winning CV. For support on how to write a high-quality CV, read on. How to ensure your CV CV Guidance how to write a winning CV stands out from the rest – what employers suggest What is the purpose of a CV? A CV is a brief representation of you; it is an advertising tool which should sell your skills, qualities and experience to an employer. You must remember that the main aim of your CV is to secure an interview! How should I structure my CV? There are many different types of CV, but there is no correct way to format your CV. You just need to remember that regardless of the CV format that you choose, it needs to ‘sell’ you in the best possible light. Employers and recruiters are human beings and, just like you and me, they get tired. Just imagine if you had over 50 CVs to look through, and you couldn’t go home until you had done it. This is why it’s important that your CV is clear, concise and stands out. We asked numerous local employers, ‘Which skills and qualities are of most importance when recruiting a new employee?’ The results, in order of importance, are shown in the table below. • Skills based – This type of CV emphasises your personal qualities, skills and voluntary work rather than your employment. It is a very popular choice for school leavers, learners and graduates. • Employment based – For those with a good, long work history. This CV will highlight your job-specific experience. 89.5% of employers asked said that their preferred method of application is a CV with a covering letter. Therefore, don’t forget to include a covering letter every time you send your CV to an employer. 9. Ambition & Drive Skills What should you do with this information? If you possess these qualities and skills, ensure that your CV highlights them! Take a few moments to write five reasons why you want to enter the industry you have chosen. This will help provide you with a focus for your CV, letters of application and interviews. Always tell the truth on your CV! Employers will refer to your CV during the interview and you will be asked to give examples of when you have used these skills and qualities. n communication skills, and I gained work experience in this sector through working for a local primary school. I am certain that this is the right career choice for me, and I am looking forward to starting work and learning new skills. St Mary’s Secondary School GCSEs Music Business Studies English Literature English Language Mathematics Double Award Science Physical Education BTEC IT. Use a clear font style and size Use clear subheadings Format and align sections Keep the length to two single-sided A4 pages Use a sensible email address! career choice for me and I am looking forward to starting work and learning new skills. Units included: • Exploring Health & Safety • Associated Theory & Underpinning Knowledge • Practical Plastering Units included: • Building Maintenance Skills • Moving and Handling Resources • Developing Bricklaying, Carpentry & Joinery, Painting & Decorating, Plumbing, Electrical Installation and Plastering Skills. Only detail your grades if they are 9-4. If you do not have any 9-4 grades, write the following: ‘GCSEs in the following subjects: Mathematics, English and Science.’ If you have up to three 9-4 grades, write the following: 10 GCSEs, including Mathematics Grade 6, English Grade 6 and Physical Education Grade 6. Achievements / Voluntary Work Try and think hard about the extra activities that you have done. This could be: • • • Assisting with the family business • • • • Childminding for your siblings • • dance groups Don’t forget to bullet point the skills and qualities that you have gained from these activities. References When an employer asks for your references, you need to include one from school / college and one from your work experience / past employers. These cannot be friends or family members! Letter Guidance - writing to employers What is a covering letter? Why send a covering letter? Because, as mentioned previously, 89.5% of the employers that we asked said that their preferred method of application is a CV with a covering letter. Speculative Letters What is the difference between a covering letter and a speculative letter? A covering letter is in response to a job that you have seen advertised, whereas a speculative letter is when you have not seen a job advertised but you are enquiring as to whether they may have a vacancy suitable for you. You can source a list of employers via www.yell.com (this is the online yellow pages). Remember, the aim of your covering letter is to attract the employerâ&#x20AC;&#x2122;s interest so that they read your CV! Your opening paragraph needs to get straight to the point but also show enthusiasm. Top tip: A weak covering letter means your application is likely to be tossed into the rejection pile, before your CV is even read. Your speculative letter can be printed and posted to employers along with your CV. Alternatively, you can hand it in personally to employers, or copy and paste it into the main body of an email. Top tip: Search for job vacancies within your sector in order to identify the skills and qualities that employers regard as desirable or essential. Ensure your social media profile pictures and name(s) are appropriate - a growing number of employers check future employees’ profiles on social sites. As we have previously discovered, many employers do not need to advertise their vacancies because they receive so many speculative applications. Although applying speculatively can be frustrating, and can appear to have a relatively low response rate, if you do find an employer with a vacancy, there will usually be less competition. Therefore, it is worth spending time making speculative applications. It’s better to call in the morning because employers will prioritise their tasks early in the morning and may not be able to spare you any time in the afternoon. While you’re actively job searching, it is important to be prepared for a phone call at a moment’s notice. You never know when a recruiter might call and ask if you have a few minutes to talk. Record a sensible answering machine message on your mobile phone. A silly message will not create a good first impression! Interview Techniques So you have been offered an interview congratulations! Now it’s important to make sure that you are properly prepared. Before a job interview, it is important to think about all the reasons why you are attending it and what you have to offer the organisation. Remember, when interviewing for an Apprenticeship, the employer is not expecting you to have lots of experience; they just want to see that you are enthusiastic about the job, willing to listen and learn, and that you are reliable. 81% of employers asked said that they would consider an applicant who had the right attitude and enthusiasm, but no experience. 95% of employers asked said that they use 1-2-1 interviews as part of their recruitment process. Plan your journey. Do a trial run and ensure that you arrive on time or early. 4 The night before your interview, decide what you are going to wear. 5 Organise all of your certificates (GCSEs, sporting achievements, etc.) and any information that you need to take with you, such as identification and licences. If you are unable to attend an interview, please notify the employer as soon as you are able. Employers’ time is very valuable and failing to tell them will ruin your chances of rearranging your interview. Face-to-Face Interviews First Impressions And NonVerbal Communication (NVC) Remember - first impressions last! We all make judgements based on first impressions, and employers will do the same. Dress Code - This is one of the most important areas of non-verbal communication. Appropriate dress code for an interview: Female: Smart trousers / skirt, blouse and jacket. No short skirts, low cut tops or flip flops. Male: Black trousers, smart black shoes, shirt and appropriate tie, plus a suit jacket if you feel comfortable. No trainers, boots, t-shirts or shorts! Eye Contact - Maintain eye contact to show that you are listening and are interested in what the interviewer has to say Posture - Posture can also show how attentive and enthusiastic you are. Try not to slouch or lean on the chair / table. Keep your posture open by not folding your arms or legs Facial Expressions - Facial expressions are difficult to control, but try to smile and not to frown. Enthusiasm and understanding can also be conveyed by simply nodding your head Gestures - Using your hands whilst you talk can often emphasise what you are saying and highlight your enthusiasm Always shake the interviewers’ hands when you meet them and when you leave Always thank the interviewer for seeing you and reiterate how interested you are in the company and the role Finally, try to relax and be confident! Interview Questions Do you have difficulty knowing how to answer interview questions? Or, maybe you have never had an interview before? This section will provide you with common interview questions and tips on how to answer them effectively. Although you cannot predict what questions you will be asked in an interview, you really can help yourself by preparing answers for some common questions. When preparing your answers remember STAR. S – Situation: Describe the situation and background - set the scene T – Task (or Target): Explain the specifics of what was required (When? Where? Who?) A – Action: What did you do? (Skills used, behaviours, characteristics) R – Result: What was the outcome? What did you learn? What are competency-based questions? •	Competency-based questions ask you about your behaviour in specific circumstances, which you then need to back up with concrete examples. Q. Tell me about yourself. Q. What attracted you to this job? • Keep to the point. • Don’t include details that they already know, such as your name. •	It would also be beneficial to talk about why this type of Apprenticeship interests you; for example, because you have some related experience and skills • Do not say that the salary, benefits or hours attracted you to the job! Q. Describe a situation where you worked in a team. If you have not had any part-time jobs, then simply talk about the work experience that you gained at school. If you are unsuccessful at interview, ensure that you contact the company and ask for feedback. If you do not gain this feedback, you will not know how to improve your interview skills. You can request feedback over the telephone, by letter or by email. Please see the next page for an example of a letter. You may choose to email the interviewer rather than send a letter, including your contact details. You may choose to sign off with ‘Kind regards’, rather than ‘Yours sincerely’. If they have not sent a reply within a week, feel free to send another email to make sure that they received it. 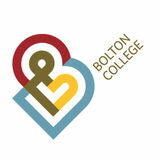 Bolton College’s Apprenticeships: FAQ’s continued What does an Apprenticeship Involve? An Apprenticeship is a real job with training. So, you can earn while you learn, picking up recognised qualifications whilst being paid a wage by your employer. As an employee, you will be working at the company alongside attending College or taking in-house training for your qualification (depending on your Apprenticeship). Your employment should cover a minimum of 30 hours per week, but in a small number of circumstances this may not be possible. In such cases, employment can be for 16 or more hours per week. Can you recommend any employers? We can recommend you to any of our employers that have current vacancies at the time of your enquiry. You can also view and apply for our current vacancies on the National Apprenticeships Services website at www.boltoncollege.ac.uk/apprenticeship-vacancies. Alternatively, you can search online business directories, such as www.yell.com to find employers in your area and approach them to see if they will employ you as an apprentice. If you’ve attended one of our Apprenticeship interview evenings, we will actively promote you to employers. Is there an age limit for Apprenticeships? There is no upper age limit on Apprenticeships. When will I start College? Most areas work on a ‘roll-on roll-off’ basis, meaning that there are staggered start dates throughout the year. For example, if you find an employer in December, you can start your Apprenticeship straight away and we will arrange a College start date with you. What is the Apprenticeship wage? To find out the current Apprenticeship minimum wage, please visit the following site www.gov.uk/national-minimum-wage-rates. As your skills develop, many employers tend to increase wages; in fact, research shows that an average apprentice earns £225 per week in the UK. If you reach age 19 and have completed the first year of your Apprenticeship, your employer must pay you at least the National Minimum Wage for those aged 18-20. If you are already aged 19 or over, and have completed the first year of your Apprenticeship, you must be paid at least the National Minimum Wage for your age.